This year marks the 100th anniversary of the Committee set up by the British Fuel Research Board to make recommendations on improving the winning, preparation and use of peat as a fuel in Ireland. 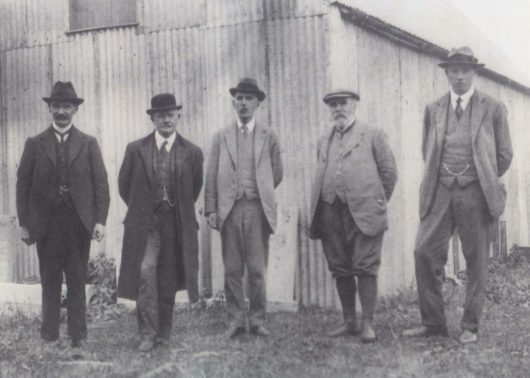 The committee Chairman was Sir John Purser Griffith who had bought Turraun bog in 1910 and set up the Leinster Carbonising Company. Part of the reason for establishing the committee was the shortage of coal during the First World War. The first step to appoint a committee was taken on March 9th 1917 and after various proposals the Irish Peat Inquiry Committee was accordingly appointed on 2nd July 1917. During the course of its work the committee met thirty two times and visited peat operations at Edenderry, Rahan and Turraun in Offaly, Ticknevin and Monasterevin in Kildare, Portgleneone in Derry, Maghery in Armagh and also a bog in Tyrone. They also studied literature on methods and machines employed in the peat industry in Europe. The committee submitted their report in February 1918 but the Fuel Research Board were not happy with parts of the report, so following this, a supplementary report was submitted in July 1918 and the Fuel Research Board adopted this in August 1918. One of the main recommendations in the original report was that the state purchase a large bog and establish an experimental station to study the best drainage methods and most appropriate machinery to produce 100,000 tonnes of machine peat per annum. Because of the likely shortage of labour it recommended the establishment of workers’ villages and the establishment of agricultural land on the adjacent cutaway. Also recommended was the establishment of a peat-fired electrical power station. The committee stated that special legislation and compulsory land acquisition powers would be needed to implement its recommendations. It seems that the prospect of the state financing a power station horrified the Fuel Research Board and the committee was persuaded to modify this in the supplementary report. The supplementary report suggested that firstly a bog of 10,000 acres be purchased for researching the best methods of drainage and that 500 acres be developed for agricultural purposes and necessary housing provided. Although nothing came of this report many of its recommendations were eventually realised by the establishment of Bord na Móna including the peat-fired power stations and houses for the workers. Eco Rangers aims to reconnect children with nature and encourage them to recognise the importance of protecting it.